$4 Drinks all night long! 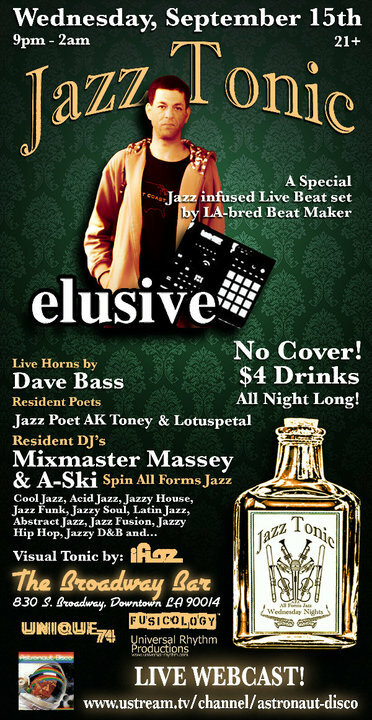 A special Jazz infused Live Beat Set by LA-bred (via Venice) Beat Maker – Elusive!!! plus special guest MC’s and Poets! For more about Jazz Tonic check out the official website! This entry was posted on September 13, 2010 by unique74mag. It was filed under Unique 74 and was tagged with Beat Maker Elusive, broadway bar, Dj A-Ski, jazz tonic, Kung Pao Kitty, Mixmaster Massey, Unique74.